Dit is de retail versie. Idyllon was the crown jewel of Faerie Queen Nivarra’s kingdom. Once upon a time. Since her passing, this once great land has dissolved into formless void. While all of the Fae kingdom has mourned this tremendous loss, you – the Guardians of the Four Winds – have vowed to restore Idyllon to its former glory. In her passing, Queen Nivarra left the Crown of Idyllon for each of you to share in equal measure until the land is renewed. And when it is, the Guardian that has built the most impressive domain shall keep the crown forevermore and become the new Lord or Lady of Idyllon. 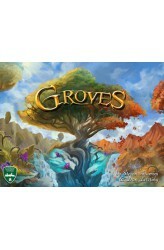 Groves is a unique strategy game that combines worker placement with bag building. There are multiple worker types that a guardian can summon to reap the benefits of the..